I promised many of you that I'd give a full and detailed recap of our childbirth experience -- and here I am, six weeks later, finally getting around to writing it out. (In my defense, Johnniegirl has been keeping me pretty busy!) If you're not into this type of thing, sorry! Please just skip this post and check back later this week for a house update or two. I woke S and told him I thought “it” might be happening. We both lay there in eager anticipation, waiting to see if what I had felt was in fact an actual contraction and whether I would feel it again. Twelve minutes later I felt the second one. We started getting excited. Five minutes after that I felt another. Then another came 3 minutes later. There was no pattern or consistency whatsoever so far, or so we thought. I decided to take a shower (part of my as-natural-as-possible hypnobirthing plan) while S sat on the bathroom floor, timing every contraction to see if they’d develop into a regular pattern. Another contraction came 3 minutes after that. And another just 3 minutes after that. And then another. “Are you sure these are really contractions?” S asked me, surprised that they were so close together and becoming regular already. Our doctor, the nurse who taught our childbirth class and all the books we read said the beginning stages of labor could take hours and hours. I had packed magazines, DVDs and a pair of comfy slippers in my hospital bag to keep us occupied and relaxed throughout centimeters 1 to 8. But I was definitely sure these were contractions, and they were already getting more and more intense. A few more came at 3 minute intervals. We were supposed to call the doctor when the contractions were 5 minutes apart, but it seemed we'd apparently skipped right over that part. So around 4:30am, as I was getting out of the shower and starting to feel slightly alarmed, S called my doctor’s emergency cell number and explained the situation. He told us to head straight to the hospital, and to consider hurrying. The excitement was mounting. I had barely gotten my clothes on before I felt an intense, unmistakable downward pressure. Our baby girl was COMING, and soon! “Okay, so, we really need to go NOW!” I shouted, kneeling on my hands and knees (the most comfortable position I could find) in the hallway. I'd been told countless timse that childbirth was nothing like the movies, but I felt like everything I was feeling and saying was coming straight from Father of the Bride II. I mean, we'd just had an earthquake, my husband was recovering from pneumonia and now I was barely going to make it to the hospital in time? It felt surreal as I fought the urge to push. We made our way to the car in stages—from the top of the stairs to the couch, then from the couch to the driveway, and then finally into the car—as I had to stop and breathe through the mounting pressure of contractions that were suddenly almost on top of each other. We barely pulled out of the driveway when I started shaking all over. I remembered from our childbirth class that this was a sign of transitioning, but despite the pain/pressure/shaking I was hesitant to believe we were that far along already. I’d only been in labor for an hour and a half at most! Nevertheless, I told S that I thought it would be okay if he broke the speed limit a little. This baby was on a mission. He got that determined look in his eye that I know and trust so well. We arrived at the hospital 15 minutes later. I made it through the first of the two sliding doors at the entrance to the birthing center, and that was all I could do – I could not go any further. (So much for walking the halls in my slippers!) A huge contraction hit, the biggest one yet, and I braced myself against the wall and stayed there. A nurse rushed toward us with a wheelchair and took me directly to a delivery room, skipping the normal triage and check-in process since I was clearly in full-blown labor. My doctor hadn’t arrived yet, so it was the on-call physician who confirmed that I was in fact 8 cm dilated and moving fast. Despite the growing intensity and pressure I was feeling, I was amazed -- if this was childbirth, I totally had this! One of the principles of hypnobirthing is that childbirth doesn’t have to be painful and violent if you do the right breathing and visualizing, which you practice beforehand. Let it be noted that I read the book thoroughly and practiced for months. Maybe it’s because I didn’t have the benefit of attending actual hypnobirthing classes (they aren’t offered in our area), but all I can say is that the method worked for me for those first 8 easy centimeters; the rest of the experience was a whole other story. 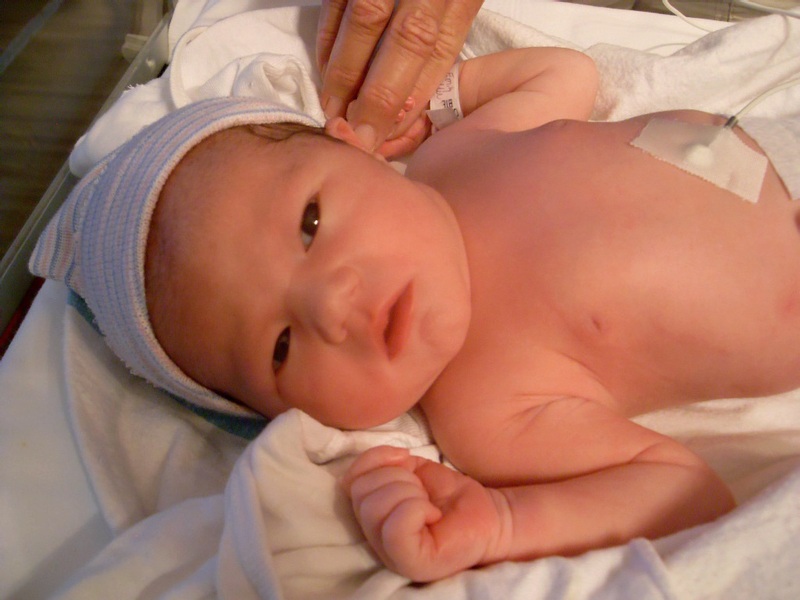 As soon as I put on the gown and got settled in the delivery room, the screaming started. It suddenly felt like I was giving birth to my own pelvis, or pooping a football, or maybe both at once. My birth plan was to have as natural a labor as possible -- no drugs or interventions unless absolutely medically necessary -- but to be perfectly honest I may have given into the epidural at that point if there had been time. As it was though, the nurses barely had time to get the fetal monitor and my IV hooked up. I kept apologizing for being so loud, but the medical staff seemed okay with it – they were all amazed that it was going so quickly, especially since this was my first baby, and telling me that I was lucky. The doctor even said she didn’t blame me for the screaming because my contractions were so intense that each one was doing the work of four. That made me feel better (at least emotionally). In less than 45 minutes I was dilated to the full 10 centimeters. Though the transitional phase didn’t take long in actual minutes, it felt like the clock was aligned to some other world's orbit. I’m not even sure who was in the room during that time. All I remember is my husband’s voice telling me over and over that our little girl would be with us soon, praying to God for strength and a nurse (whose name and face I wouldn’t recognize if my life depended on it) holding my right hand and helping me breathe. The rest is just periods of out-of-body screaming with short phases of trance-like rest and breathing in between. Though the supposed gentleness of hypnobirthing eluded me, I did manage to maintain those periods of recovery between contractions -- thanks hypnobirthing! And then my water broke. (Warning: This part is not for the squeamish.) When I say my water “broke,” I mean it shot out like a hot cannonball and exploded on the doctor’s lap in one shot. Everyone in the room gasped and burst out laughing. S shouted, “WOW! That was the most amazing thing I’ve ever seen!” I felt that I maybe should be embarrassed, but I just felt instant relief from the intense pressure. My actual doctor finally arrived just as it was time to push—the part of childbirth I had been most nervous about for all the years I'd known where babies come from. Hypnobirthing says you shouldn’t actually “push” but instead “breathe the baby down” with a special breathing technique that I practiced beforehand. This technique did not work in reality. However, pushing turned out to actually feel really satisfying, as I’d been feeling the urge almost since we arrived at the hospital. Her head was visible after the first push, and I ended up pushing for 10 minutes total before the doctor laid her on my chest at 6:24am -- less than 3 hours after I felt that first contraction! Yes, I realize how incredibly fortunate I am! Though my experience may have been a little more intense or concentrated than some women's, I cannot imagine how exhausting and difficult it would be to labor and push for hours on end as some women do. Though it did not go completely as planned, I really would not change how our delivery happened. It sounds so cliche, but that moment was like a dream. It turned out to be true for me, what they say about how you home in on this new little squirming life and forget the pain immediately. I didn't feel like a million bucks, and the post-birth stuff wasn't exactly pleasant, but I didn't care either. We had done it! She was determined, I was tough, S was supportive, and we were finally all together and healthy. That's all that mattered. I no longer cared that I had embarrassed myself and frightened all the other patients in the ward with my banshee screams. It was the most amazing moment of my life, and despite the sleep deprivation and constant work of taking care of a newborn, the novelty of her presence still hasn't worn off yet. After the doctor finished up and was leaving the room, he said, "You had the perfect pregnancy and birth. Same time next year?" HA HA HA, said my uterus. Then he added, "Just so you know, subsequent births usually go faster, so next time we will have to induce you a little early so you don't end up giving birth on the side of the road." what a great story! thanks for sharing your experience. i think i'd rather have fast & concentrated than the "in labor for 28 hours" variety! and little Johnnie is SO sweet!! Kissable little face. I miss my own babies. They're all big, hairy and miles away, with babies of their own. Incredible story! You did a great job, mama!